I packed these crackers on a winter trip to the north woods of Wisconsin, and we ate them with organic raw cheese and homemade raw jerky from a grass-fed steer. 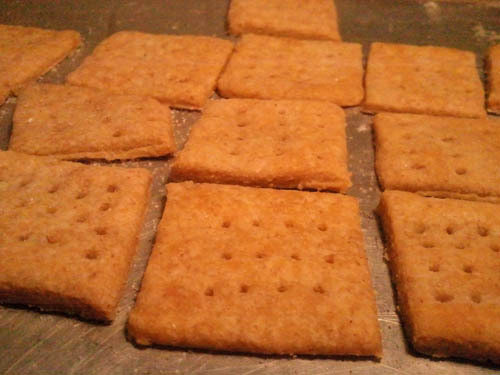 The butter I used in the crackers was deep yellow, in fact, raw too until the crackers were baked. To me, it was the most nourishing travel meal imaginable, because at the time, I was reading a book (Cure Tooth Decay, by Ramiel Nagel) that explains how to remineralize your teeth and reverse tooth decay by eating traditional foods, especially high quality, organic, yellow butter, soaked or sprouted whole grains, raw cheese, and grass fed meats. This recipe comes straight from the Nourishing Traditions cookbook, but it’s not a cracker recipe in the book. It’s actually the recipe for Yogurt Dough, which is used to make crusts for empanadas and even pizza. 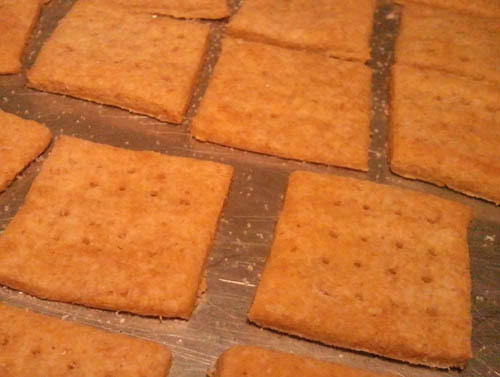 In somebody’s real food blog – sorry, I can’t remember whose it was – I read that this recipe produces crackers that taste a lot like Wheat Thins. And it does! It’s a simple recipe too, and best if you actually take the time to soak the flour. I use yogurt sometimes, but most often, kefir is what I have in the fridge, and I think I like it’s flavor best in the crackers. You can use either. In the Nourishing Traditions cookbook, the recipe calls for creaming the butter and yogurt together, but I’ve never had any luck with that method. Instead, I’d suggest that you mix the yogurt with half of the flour and half of the salt in one bowl, and mix the butter with the other half of the flour and salt in another bowl. Once you have two separate balls of dough, one with yogurt and the other with butter, combine the two together. I do it this way, sometimes it produces a cracker with pretty marbling. 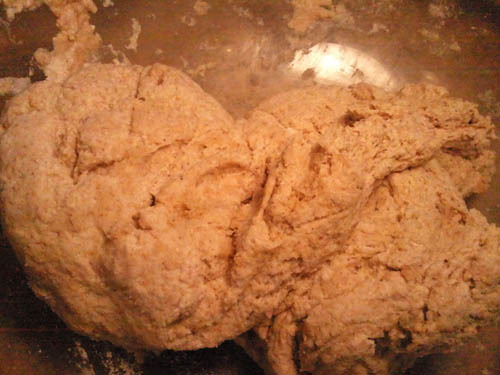 Cover the dough and leave it at room temperature for 8-12 hours. Use a pastry cloth if you have one. 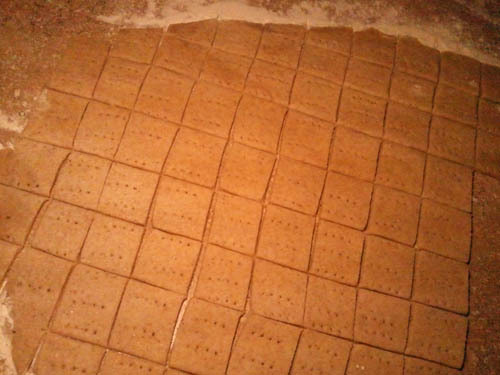 Otherwise, just sprinkle some unbleached flour on the counter to keep the cracker dough from sticking. Roll the dough to about 1/8 inch thick. It’s nice to sprinkle salt on at this point and give the dough one more light rolling to press the salt in a bit. Or you can sprinkle it on later. Either with a pizza cutter or a knife, cut out your crackers. Prick with a fork. Transfer them to an ungreased metal cookie sheet and bake for about 20 minutes, checking now and then to be sure they don’t burn. They’re done when they’re golden brown on the edges.